What Is the History of Crutches? What Is the Function of Crutches? What Are the Different Types of Crutches? Since antiquity humans have fashioned support devices to hold themselves up when they became sick or injured. Support device use dates back to 2830 BC. A carving on the entrance of an Egyptian tomb depicts a figure leaning on a crutch-like staff. Crutch design has evolved from the basic "T" used by Tiny Tim in A Christmas Carol to lightweight aluminum braces with ice-gripping tips or energy-storing tips that function as shock absorbers and are slip resistant. For lower-limb injuries such as a broken leg, broken ankle, sprained ankle, knee injuries, and other injuries, as well as after surgery on the leg, knee, ankle, or foot, crutches remain useful today to decrease discomfort, reduce recovery time, and assist walking. Often when you get a cast put on your leg or foot you will be required to use crutches for a period of time. Crutches may also be used by amputees, and people with other disabilities that make walking difficult. A crutch must do two things: reduce weight load on one of your legs and broaden your support base to improve your balance and stability. The support also should assist upright movement and transmit sensory cues through the hands. A crutch allows people with paralysis or other disabilities the benefits of upright posture and lets them maneuver in places they cannot go with a wheelchair. A crutch becomes necessary when a person cannot walk or walks with extreme difficulty. Any person with leg or foot pain or injury, weak muscles, or an unstable gait may benefit from using a crutch or crutches. Regaining upright body movement aids circulation, assists kidney and lung functions, and helps prevent calcium loss from your bones. Crutches shift the force of upright movement from your legs to your upper body. You must have sufficient arm strength, balance, and coordination to use them effectively. There are several basic types of crutches: axillary (underarm), forearm (Lofstrand), platform, strutter, and leg support. All should be custom fitted properly to help reduce movement problems. Crutches are made in all sizes, for adults and children. Axillary crutch: This is the most common type. Wooden or aluminum models can be adjusted easily to your overall height and hand height. In the stationary position, the top of the crutch should extend from a point the width of two to three fingers below the armpit (axilla) to a point on the floor 15 cm-20 cm (6 in-8 in) outside your foot. Your hand should rest at a level that allows you to flex your elbow at about 30°. If you are unable to stand, simply subtract 16 inches from your height to determine the crutch length you need. Forearm crutch (also known as the Lofstrand crutch, or elbow crutch): This crutch should allow you to flex your elbow 15°-30°. The increased flexion allows your arm to bear greater weight. The crutch should contact the floor 5 cm-10 cm (2 in-4 in) outside and 15 cm (6 in) in front of your foot. The cuff on the crutch should sit 2.5 cm-4 cm (1 in-1.5 in) below the back of the elbow. Some forearm crutches are ergonomic, designed for more comfort and reduced chance of injury. This type of crutch is common in Europe, however in the U.S. generally only people with lifelong disabilities such as polio use this type of crutch. Platform crutch: Also known as a triceps crutch, this crutch should contact roughly 5 cm (2 in) below the skinfold of the armpit. The lower cuff should lie 1 cm-4 cm (0.5 in-1.5 in) below the back of the elbow to avoid bony contact on the arm yet provide stability. Strutter crutch: This crutch is a type of underarm crutch that has larger crutch tips that remain flat on the floor. This allows for improved weight distribution and more even walking gait. Leg support crutches: These are like a knee scooter where the affected leg is strapped into a support frame on wheels. Leg support crutches are particularly useful for below the knee injuries or postoperatively after below-the-knee surgery that affects one leg only. Many of these types of crutches can also be found in a folding variety, where the crutches are designed to fold in half, making them easier to store. Before you begin using crutches, your doctor, nurse, or physical therapist will show you how to adjust the crutches so they are the right height for you. If a patient has never used a crutch, they should not do so without instructions and ideally, to be safe, a trained assistant. To begin walking with crutches, gradually shift your weight to your healthy leg. Move the crutches in front of you to a point at which you can maintain stability. For the swing movement, shift your weight from your healthy leg to your arms, swinging your body through the crutches as the crutches take up the weight. Plant your healthy leg at a point ahead, again maintaining stability, and shift your weight back to the leg. Then move the crutches forward to repeat the movement. Studies have shown that your wrist receives from one to more than three times your body weight during the swing phase of walking with crutches -- a load the upper body was not designed to sustain. Never support yourself on your armpits. Hold the handgrips for support. While standing, place the crutches 8 in-10 in front of you. While walking, do not try to move too quickly or to cover too long a distance with each step. Keep the crutches close to your body. Generally, people use a swinging gait, where the crutches are advanced and stabilized then the feet swung through after stabilization of the crutches has occurred. While using them on the stairs, have someone assist you. While going downstairs, place the crutches on the next step below, then step down with the good leg. While going upstairs, step up with the good leg first, then bring the crutches up. If using just one crutch, techniques for walking start with placing the crutch under the arm opposite your weaker leg. Move the crutch and your weaker leg forward at the same time. Then take a step with your stronger leg. You may struggle with how to make crutches more comfortable. Crutch comfort can become an issue, as your body acclimates to their use. Cushioned covers or pads for the underarm and handgrip areas may be purchased. Treatment for a broken bone in the foot depends on which bone is broken and how it is broken. Some broken bones in the foot can be treated with crutches and flat-bottom shoes, others require splints or casts or boots, and still others require surgery to repair the bones. 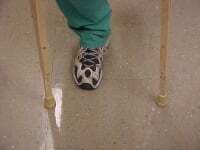 Crutches are used to help the injured person walk when the foot is broken. When walking using crutches it is important that they fit properly and that you use them correctly. Your doctor should adjust your crutches to fit you and show you how to use them. When using crutches, put your weight on your arms and hands. Do not put your weight on your underarms (armpits). This could hurt the nerves in your underarms. To avoid falling, use your crutches only on firm ground. American Academy of Orthopaedic Surgeons. "How to Use Crutches, Canes, and Walkers." February 2015. <http://orthoinfo.aaos.org/topic.cfm?topic=a00181>. Bruno J. 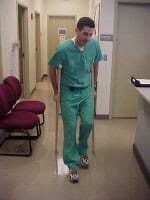 Some considerations and guidelines for crutch walking. Clin Podiatry. Aug 1984;1(2):291-4. Decker BC. In: Peat Malcolm, ed. Current Physical Therapy. Mosby; 1988. Downer AH. Mobilation aids. In: Physical Therapy Procedures. Charles C Thomas; 1994. Eiff PM, Hatch RL, Calmbach WL, et al. Fracture Management for Primary Care. Philadelphia, Pa: WB Saunders Co; 1998. "How to Use Crutches." American Orthopaedic Foot & Ankle Society. FootCareMD. 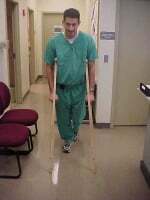 <http://www.aofas.org/footcaremd/how-to/foot-injury/Pages/How-to-Use-Crutches.aspx>. "How to Use Crutches, Canes, and Walkers." American Academy of Orthopaedic Surgeons. OrthoInfo. July 2007. <http://orthoinfo.aaos.org/topic.cfm?topic=A00181>. "How to Use Crutches Properly." The Nebraska Medical Center. YouTube.com. Mar. 7, 2011. <http://www.youtube.com/watch?v=pYzUQb79_Rw>. Joyce BM, Kirby RL. Canes, crutches and walkers. Am Fam Physician. Feb 1991;43(2):535-42. Kottke FJ, Lehmann JF. Handbook of Physical Medicine and Rehabilitation. 4th ed. Philadelphia, Pa: WB Saunders Co; 1990. Lane PL, LeBlanc R. Crutch walking. Orthop Nurs. Sep-Oct 1990;9(5):31-8. Nyland, J., T. Bernasek, B. Markee, and C. Dundore. "Comparison of the Easy Strutter Functional Orthosis System and axillary crutches during modified 3-point gait." J Rehabil Res Dev 41.2 Mar. 2004: 195-206. <http://www.ncbi.nlm.nih.gov/pubmed/15558373>. University of Pittsburgh Schools of the Health Sciences. "Walking With One Crutch." <http://www.upmc.com/patients-visitors/education/rehab/Pages/walking-with-one-crutch.aspx>. Please describe your experience with crutches.